GitHub - probot/stale-action: Just like the Stale app, but for Actions! Just like the Stale app, but for Actions! Want to be notified of new releases in probot/stale-action? This action is adapted from Probot's Stale app, built by @bkeepers, which itself was onspired by @parkr's auto-reply bot that runs @jekyllbot. It uses Actions-Toolkit by @JasonEtco and is built to be scheduled by triggering a repository_dispatch HTTP event from an external service, allowing you to customize how often to scan for stale content. Create .github/stale.yml based on the following template. Create a main.workflow based off the example.workflow in this repository, which will start a scan in response to a schedule event. This will schedule as can of your repository however often you specify using CRON syntax. The default schedule in the example will run every day at 12:00AM UTC (0 0 * * *), but we recommend you run this at a time that's conveninet for you. The Actions UI will show the next two scheduled runs to help you gain confidence that the syntax translates to a good schedule. 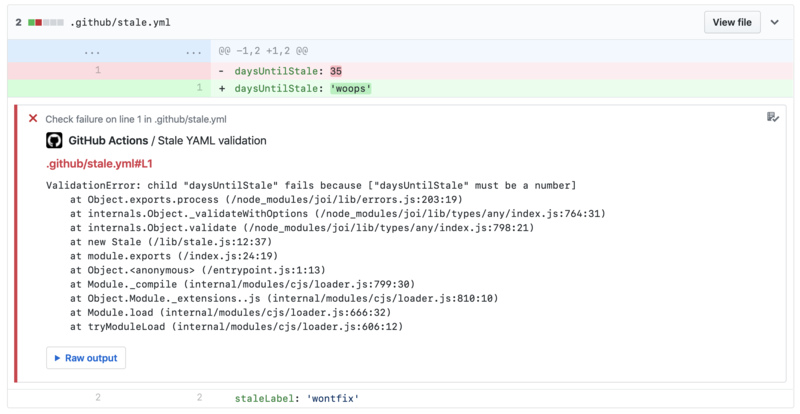 # Number of days of inactivity before an Issue or Pull Request with the stale label is closed. # Set to false to disable. If disabled, issues still need to be closed manually, but will remain marked as stale. # Comment to post when removing the stale label. # Comment to post when closing a stale Issue or Pull Request. Right now it will only send annotations for values that don't match the schema. If you have bad YAML syntax, the config will fail to load and you should see relevant errors in the Actions logs. The main.workflow file contains multiple on events. The main one that triggers a scan for stale content is on = "repository_dispatch". The others are events that listen for activity on issues and pull requests to unmark them if they were previously marked as stale. on = "schedule(0 0 * * *)"